Contrary to the all the buzz being generated recently, The Legend of Zelda: Twilight Princess is not the only Zelda game on display here at E3. Nintendo is also giving us a chance to get our grubby mitts all over the recently announced The Legend of Zelda: Phantom Hourglass for Nintendo DS. According to Big N, this next chapter in the Zelda series picks up where Wind Waker left off. Where exactly is that? I\'m not exactly sure. But I do know that Phantom Hourglass is shaping up to be yet another fantastic adventure. The demo was split up into four different areas including overworld, ocean, a short dungeon, and a boss fight. The basic mechanics were the same for each zone, but it did show what kinds of tricks the designers are preparing to throw at us. The graphics of Phantom Hourglass are just as stylized as those of its big brother on the GameCube. While obviously not as smooth as those on the console, the toon-style is well done on the DS and the only times thing look a little iffy is when a character is zoomed in on. And just as the 3D models and characters look good, the blending of 2D action is well done and works great on the DS. While the top screen usually holds the map while all the action takes place on the touch screen, in some special cases things will change and, like the boss battle, the two screens will stack to form one tall screen on which to do battle. Now for the big feature of the game, and that is that Phantom Hourglass is controlled almost exclusively via the DS touch screen. For those of you who are not exactly keen on being forced to use the stylus, don\'t freak out yet. The fairy we have seen in the trailer once again acts as Link\'s guide. Only this time the relationship is far more direct with the fairy acting as the in-game representation of your stylus. 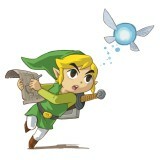 Wherever you touch the screen is where the fairy will be, and Link will follow it as if he is a dog on a leash. I was very surprised at how well the system actually worked. Unlike some games which have tried a similar system (see the broken Tao\'s Adventure) the stylus control in Phantom Hourglass allows you to guide Link on a precise course as well as adjust his running/walking speed according to how close you hold the fairy to him. Most other actions such as talking to NPCs, picking up crates, opening chests, and attacking enemies is all done with a simple tap of the stylus. Simple and effective is the name of the game. Whatever item you currently have with you, in the case of the demo either bombs or the boomerang, is shown in an icon at the top right corner of the touch screen. These can be used either by touching the icon or pressing/holding the L or R button. After whipping out a bomb, simply tapping where you want the bomb to go will have Link throw it and, as expected, the boomerang is held in Link\'s hand as you draw the path it will travel. One feature that got me excited when I saw the trailer was the ability for you to put notes on your map. And after getting a chance to try it for myself I can\'t help but wonder why nobody did it sooner. Bringing up the map is quick and simple, and adding a note with a quick scribble of the stylus is just as easy. And for those of you curious about oversights that may be made, yes, there is an eraser function available in case you screw up or get a little to crazy with your notes. While there is no date set for The Legend of Zelda: Phantom Hourglass yet, Zelda fans should already be looking forward to it. Despite its dependency on the touch screen, the game controls very well and the graphics, while still holding onto the stylized look of Wind Waker, look very good on the DS. While Twilight Princess may be one of the most popular games at E3, it would be foolish to overlook one of the best games here for the DS in Phantom Hourglass.